Sail on our 12-passenger ship to experience penguins, albatross, seals, and more during 13 landing days. 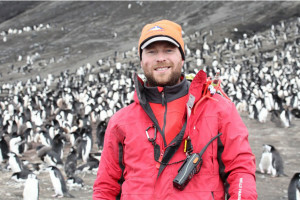 Tom Murphy will help you improve your natural history knowledge and photography skills, and Tom Hart will teach you about penguin biology while you actively participate in his research. The islands are rich with wildlife and each landing will have something special to offer. We aim to explore the largest black-browed albatross colony in the world at Steeple Jason, and visit colonies of gentoo, Magellanic, and rockhopper penguins. Explore Sea Lion Island, the most species-rich site in all the Falklands with time to watch South American sea lions and observe orcas patrolling for unwary southern elephant seals. Witness Magellanic penguins as they ride the surf in to the beach and then waddle to their underground burrows. You will benefit from the ease and flexibility of getting such a small number of travelers ashore, likely visiting sites rarely or never accessed by larger tour vessels. Come share the wildlife treasures that this special archipelago offers. • Marvel as you sit quietly alongside the largest black-browed albatross colony in the world, observing as they take off, land, court, and preen each other. • Explore seldom-visited corners of this archipelago, traveling with a freedom increasingly more difficult in our crowded world. • Enjoy the flexibility and serenity of being aboard a small, 12-passenger vessel. • Take ample time to create your best photographs, and/or discover the joy of participating in scientific research. For most traveling to Santiago, you will need to leave home today. Take the once-weekly flight from Santiago to Mount Pleasant Airport in the Falkland Islands (not included in trip cost). Then, you will transfer to San Carlos to board the Hans Hansson and begin your journey amid the Falkland Islands. The Falkland Islands, approximately 300mi east of South America and 700mi north of Antarctica, have a temperate, but sometimes foggy climate. At this time of year, we hope to enjoy some of their rare Austral summer sunshine. Out of the 300 or more islands in the Falklands, we plan to land on those best for wildlife viewing and photography. Many of these islands are privately owned and open to ecotourism on a very limited basis, putting wildlife conservation interests above development. Due to the expeditionary nature of our voyage, specific stops cannot be guaranteed. Flexibility is paramount in expedition travel; our itinerary depends on the conditions. We strive to land often and stay as long as possible. Contrary to what its name suggests, Carcass island hosts many charismatic animals and a variety of habitats. As you explore the surroundings of the main settlement, discover Magellanic penguins nesting nearby, and with just a short walk, you will stumble upon a gentoo penguin colony. Southern elephant seals, imperial cormorants, striated caracaras, black-crowned night-herons, and short-eared owls are also found throughout the island. As the island is cat and rat free and an Important Bird Area, a global standard set by Birdlife International, you’ll find many ground nesting birds including the endemic Cobb's wren and other songbirds such as blackish cinclodes, dark-faced ground-tyrant, correndera pipit, austral thrush, long-tailed meadowlark, and sedge wren. Weather permitting, we'll also visit the nearby West Point Island and spend the day photographing rockhopper penguins and black-browed albatross at the Devil's Nose Cliffs. The sheer abundance of wildlife in such a small area makes Sea Lion Island a must on any Falklands itinerary; it is one of the smallest islands in the Falklands archipelago (just 5mi long and 1mi wide at its widest point). It hosts over 47 bird species, including rockhopper, gentoo, and Magellanic penguins; you will be graced by some of the 2,800 breeding pairs of gentoo penguins and scatterings of southern giant-petrels on nests. Other birds you may encounter are South American snipe, rufous-chested dotterel, and the endemic Cobb’s and sedge wrens, small birds that have recently been afforded protection from the tall grass that has been allowed to grow after the removal of sheep from the island. However, perhaps by far the biggest attraction is the large number of southern elephant seals that breed here, principally on the white sandy beach at the appropriately named Elephant Corner. Also, not to be missed, are the South American sea lions at East Loafers. You may also witness pods of orcas circling close offshore (usually a treat for the early risers), attracted by the prospect of penguins and seals. The proximity of much of this wildlife and the easy walking terrain makes it a great destination. Award-winning, world renowned photographers have adorned books and magazines with their prize-winning shots of the wildlife on Sea Lion Island, but even with the most basic equipment you can take away images to treasure. This small group of islands forms a rocky-ridged chain with some of the most breathtaking scenery and wildlife you can imagine. The island names ("Steeple," "Grand," "Elephant," and "Flat,") conjure alluring and romantic images. Steeple Jason Island is now a reserve owned by Wildlife Conservation Society and is a haven for bird lovers. As you approach the island, you will see a series of dramatic rocky peaks rising steeply from the shore, the highest at 952ft, with an isthmus separating two main areas of land. There, you will immerse yourself into the world's largest colony of black-browed albatross containing at least a half million birds! From a distance, the immense colony on the lower shores looks like freshly fallen snow. These beautiful birds soar gracefully on the sea breezes, occasionally performing a clumsy landing onshore. Amongst the albatross are rockhopper penguins and imperial cormorants. Striated caracaras nest nearby with skuas, displaying their aggressive breeding behaviors. Enjoy watching these fascinating, inquisitive birds from a suitable distance. They may even come to you! Similarly, respect the breeding areas of southern giant-petrels, the largest of all petrels, which you’ll see flying elegantly along the shoreline. It's likely that the large numbers of birds here were noticed by early explorers who saw the penguins as an excellent source of oil. A few remnants of these dark days, such as large rusting trypots, can be found in the sheltered harbors. Today, these practices have stopped, and the island is an uninhabited nature reserve, a birding paradise. Far from being bleak, you will approach this island’s protected coves to discover gentoo, rockhopper, and Magellanic penguins traversing back and forth from the inviting sandy beaches up to Penguin Hill. A short hike up from Sandy Bay to Long Gulch will reward you with good sightings of many Falkland breeding birds including southern caracaras, brown skuas, and ruddy-headed geese. This Important Bird Area is also home to other species including imperial cormorants, sedge wrens, blackish cinclodes, and the rare flying steamer-duck. Because the island is also a sustainably managed farm, you’ll find sheep and Hereford cattle grazing on the prairies meandering through wildflowers like dog orchid, yellow orchids, as well as the beautiful endemic red and yellow calceolaria, known as the lady’s slipper. George and Barren Islands lie at the southern entrance to Falkland Sound, the channel of water dividing East and West Falkland. As you approach their sheltered, sandy coves, you may notice odd sandstone sculptures that were shaped over the last Ice Age. Amongst these sculptures, a multitude of bird colonies have established themselves including sooty shearwaters, Cobb's wren, and striated caracaras. On the shores, keep a look out for the magnificent southern giant-petrels camouflaging themselves into the ground to roost. 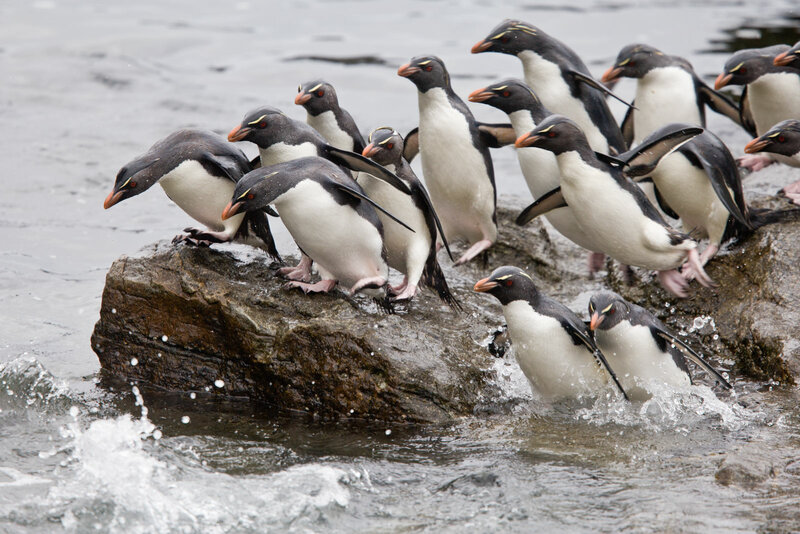 Amongst the other wildlife, witness over 10,000 pairs of gentoo and Magellanic penguins going about their daily routines. Both Islands also contain large colonies of South American sea lions plus southern elephant seals. One of the few places in the Falklands with an airstrip and coincidentally owned by Jerome and Dion Poncet, former owners of the Hans Hansson! Here, you will encounter wildlife including gentoo penguins, South American gray foxes, peregrine falcons, southern and striated caracaras, guanacos, fur seals, and many seabirds. This Important Bird Area is home to 40 recorded species, with 34 known to breed here. The island also has a farm with large reindeers that blend beautifully with this unique landscape. Saunders is both an ecologically and historically rich island. The first British settlement on the Falkland Islands, Port Egmont, was built here in 1765. You can visit the vestiges of this early settlement with a short walk from the present settlement. You will also explore the island’s exceptional wildlife and varied terrain from rocky hills to sweeping shorelines. This Important Bird Area is one of the few islands where you can find all five breeding species of penguin along with black-browed albatross and many other birds! To the northwest, you will reach a narrow isthmus nicknamed "The Neck." The Neck is named for the broad sandy beach lying between Mount Harston and Mount Richards. This location boasts a diverse array of seabird species and spectacular landscapes that will leave you in awe. As you gaze through this unique landscape, find gentoo and king penguins nesting on the beach in between the mountains. Further up, you will see extensive Magellanic penguin burrows buzzing with activity, with predatory caracaras on the grassy hillsides. Two southern rockhopper penguin rookeries are within easy walking access, plus more black-browed albatross nesting areas. Here, you may witness particularly spectacular sunsets, as the setting sun bathes the gentoo colonies on the beach with warm golden light. Named for the attractive, unusual pebbles found on some of the beaches, you will quickly learn that this island has much more to offer. Elephant Beach, a stunning 4mi long beach (the longest in the Falklands), is beautifully contrasted by First Mountain, which reaches 909ft. You can also hike to ponds and lakes in the east, which are home to waterfowl including the largest concentration of black-necked swans. In this Important Bird Area, you can also observe gentoo, Magellanic, and rockhopper penguins; the latter occasionally interspersed with macaroni penguins. This broad, mile-long sandy beach is home to a large king penguin colony plus nesting gentoo and Magellanic penguins. Depending on the schedule, you may experience the incredible sunrise and sunset at Volunteer Point, when thousands of penguins head out to sea to feed in the morning and return to their nests at dusk. Once you arrive in the northern reaches of the Falklands, you will find the Salvador Farm, also known as Gibraltar Station, located in this picturesque site with stunning cliffs and white sandy beaches. It is home to a range of wildlife including rockhopper and a few macaroni penguins which sometimes interbreed to produce hybrid offspring! Many other birds inhabit the shores including southern giant-petrel and various species of gulls. You may also encounter South American sea lions gazing at you inquisitively as they bask in the tussac grass. On the opposite southern end of the Falklands is an area that can only be reached by a long off-road journey or by boat, making it a remote and well-preserved wildlife sanctuary hidden within the North Arm Farm. Here, you will enjoy walks amongst both gentoo and Magellanic penguin breeding grounds. This Important Bird Area will also provide you with some of the most accessible wildlife including upland geese, kelp geese, Falklands steamer-ducks, finches, blackish cinclodes, long-tailed meadowlarks, dark-faced ground-tyrants, and austral thrushes. Interspersed amongst them, you may even spot the occasional striated caracaras or a variable hawk. South American sea lions and southern elephant seals sometimes haul out on the coast. As you explore, don’t forget to look down for the many native plants that grow in the area including the rare Antarctic eyebright. Named after Charles Darwin, who carried out a zoological survey of the Falklands on the Beagle's second voyage, the settlement of Darwin was founded approximately a quarter of a century after Charles Darwin's visit. It was known occasionally (and still is from time to time) as Port Darwin. Here, you will find a corral, the Galpon building, which was home to 19th century gauchos, the Argentine Military Cemetery, and extensive birdlife both in the Sound and the pond. A small racecourse is also here, for local amateur and hobby horse riders. As you make your way through a large open harbor, you will approach this port tucked away in a tiny corner. Port Stephens offers fantastic wildlife and walking opportunities. You can see all five species of penguins here, including macaroni, gentoos, kings, rockhoppers, and Magellanic all breeding at Wood Cove and Stephen’s Peak, along with many other species of birds. Marine mammals are also frequently seen here. Nearby, you can visit a geological phenomenon named "Indian Village" which consists of a series of unusual rock formations which characterize a section of the local farmland. Here, you will indeed encounter something new as this island’s terrain is one of the most varied and impressive of the archipelago, with spectacular cliffs, white sand beaches, secret coves, rugged hills, and small open plains. You will find New Island rich with wildlife immediately upon landing, greeted by fascinating Falkland steamer-ducks, ruddy-headed goose, caracaras, shorebirds, blackish cinclodes, dark-faced ground-tyrant, long-tailed meadowlark, white-bridled finch, peregrine falcons, and gentoo, Magellanic, and rockhopper penguins. You will have amazing views of black-browed albatross courting atop their conical mud nests along the cliffs. You may also encounter South American fur seal. Other highlights include both Peale’s and Commerson’s dolphins that occasionally bow ride with the ship or even alongside the Zodiacs going from ship to shore and back. You will dock at Stanley, Falkland Islands by early morning. After breakfast, you will disembark the Hans Hansson and transfer to the Mount Pleasant airport to fly back to Santiago, Chile and connect to international flights homeward. All leaders, transport, permits, landing fees, passenger fees, and port taxes. Accommodations for the nights of October 18 through November 1. 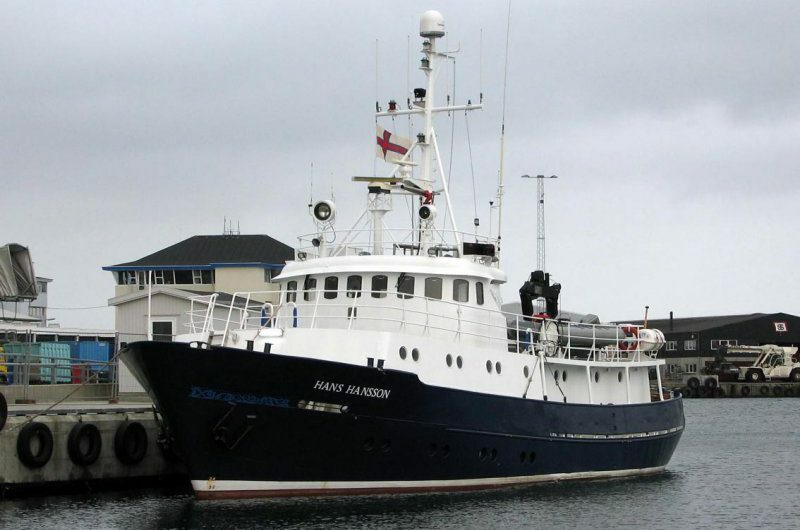 Fourteen nights on board the Hans Hansson. Meals from breakfast on October 19 through breakfast on November 2 (NOTE: Due to the expedition nature of this trip and the vessel size, we cannot accommodate vegan and gluten-free diets as meals are all prepared together in one small area. Lunch is usually vegetarian, but dinner is usually non-vegetarian (usually containing beef) with a vegetarian side dish). Airport transfers on October 19 and November 2 between the airport and the ship. Non-alcoholic beverages plus wine and beer during dinner while aboard the Hans Hansson. Rubber boots on loan while aboard the Hans Hansson. All Airfare, airport and departure taxes, and excess baggage fees. Airfare is approximately $800–$1,200 round trip from the USA to Santiago, Chile, plus approximately $1,200 for the Santiago and Mount Pleasant round-trip flights. Gratuities for the ship’s crew. Tipping is, of course, discretionary, however we suggest budgeting $10 to $15 per participant per day for October 19 to November 2 aboard the Hans Hansson ($150 to $225 total per participant). Tom Murphy and Tom Hart do not expect a tip. Emergency medical and evacuation insurance is required for you to purchase. Read more about travel insurance. In the Falkland Islands, average temperatures range from nighttime lows of about 35°F (2°C) to daytime highs of 50°F (10°C). Wet, penetrating cold is not usually a problem, but you will need to protect against almost constant wind and sea splash, especially when riding in the Zodiacs. In Santiago, the average temperatures range from nighttime lows of about 45°F (7°C) to daytime highs of about 75°F (24°C). Participating in this voyage does not require a high level of physical fitness, but please be sure that you can: (1) stay without medical assistance for the duration of the trip, (2) swim or float, (3) be sufficiently stable on your feet that you can, for example, stand on a bus/train in normal conditions without (or minimally) holding on, (4) get in and out of a Zodiac on a beach with a little swell, (5) walk 10 blocks without getting exhausted, and (6) climb a 6ft vertical ladder. Once on shore, you can walk for short or long distances (within specified guidelines); it is up to you. Landing details will be given in advance of each landing. Please contact us if you have any health or fitness concerns that may make this trip challenging. Flights you (or a travel agent) book: Arrive in Santiago, Chile (SCL) by October 18. Depart from Santiago (SCL) in the afternoon on or after November 2. Flights we book for you: Round-trip flights between Santiago (SCL) and Mount Pleasant (MPN). The cost of this round-trip booking will be added to your final trip balance. In addition to travelling to unique, amazing, and remote destinations, our voyage advances the scientific understanding of ecosystems we care about. 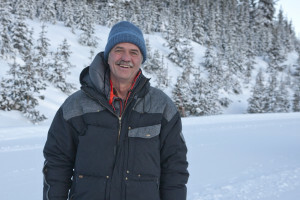 Dr. Tom Hart, of the University of Oxford, will join our expedition to collect samples, make observations, and record data to help contribute to his ongoing research. You can see his work close up as he establishes and services remote field cameras that remain in place year-round. These cameras, deployed extensively in the Antarctic, South Georgia Island, the South Sandwich Islands, and the Arctic, are very effective at revealing unexpected patterns in seabird breeding biology, such as penguins visiting their otherwise abandoned colonies in the middle of winter. Why do they do this? Join us and learn from Tom! What is the difference between the ship-based and the land-based safaris? Our land-based and ship-based Falkland Islands safaris both offer unique and thorough explorations of this remote archipelago. With a prearranged itinerary, our land-based safari takes you through a seven-island circuit by Land Rover, bus, small boat, and plane, staying at some of the best wilderness sites and lodges these islands offer, giving you ample time and freedom to explore. For our ship-based safari will travel by sea on a 12-passenger vessel, including 13 full landing days, offering a more flexible itinerary based on conditions and best wildlife opportunities. Visiting by ship allows you to make landings in seldom-visited sites that are inaccessible by land. Will I see different wildlife at different times of the year? 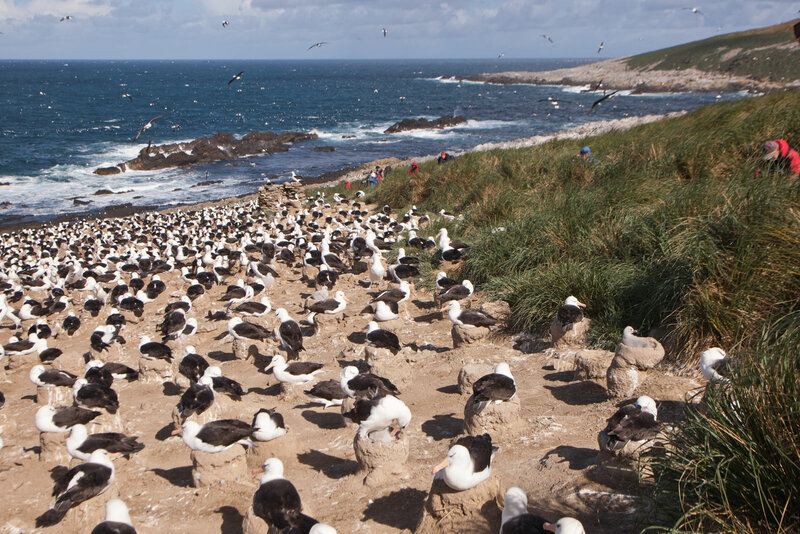 The best time to visit the Falkland Islands is between October and April. During these months, the weather is warmer, and the wildlife is more abundant. Beginning in September, much of the wildlife begins its mating season. By October, penguins and albatross have returned to their colonies and are building nests and laying eggs; gentoo penguins can be quite the spectacle as they steal each other’s nest-building materials. October is also the best time to see elephant seals as they are giving birth. In November and December, most birds are incubating their eggs as sea lions and elephant seals continue hauling out to establish colonies and mate. Once January and February arrive, you’ll find many young fluffy newborn chicks discovering their surroundings, including Magellanic penguins, gentoo penguins, king penguins, and albatross. Sea lion pups are also most abundant in January. As March and April’s declining temperatures show the first signs of the approaching winter, penguin chicks have reached different stages of fledging, and sea lions have finished hauling out. By the end of May, most birds have departed for the sea or for South America, although some small birds and roughly half of the gentoo penguins winter on the islands.